Gas-refrigerators.com carries the most reliable off-grid refrigerators available in today's marketplace. Gas refrigerators are extremely reliable, efficient, and quiet. Why? Because they have no moving parts. Our selection is the largest on the internet for reliable refrigeration. Our line includes: Servel RGE400 by Dometic, Larger Crystal Cold and Diamond Refrigerators. Our gas refrigerators are either freestanding, built-in, or portable for you to take camping or to your next tailgate party. Ammonia absorption refrigeration is a popular cooling alternative for a cabin retreat or even in your permanent residence. Current sizes of refrigerators range from 8 cubic feet up to 21 cubic feet. With this selection you will be able to choose your color, size, and function that best suits your needs. The unit consists of four main parts - the boiler, condenser, evaporator and absorber. The unit can be run on either electricity, kerosene or gas. When the unit operates on kerosene or gas the heat is supplied by a burner which is fitted underneath the central tube (A) and when the unit operates on electricity the heat is supplied by a heating element inserted in the pocket (B). 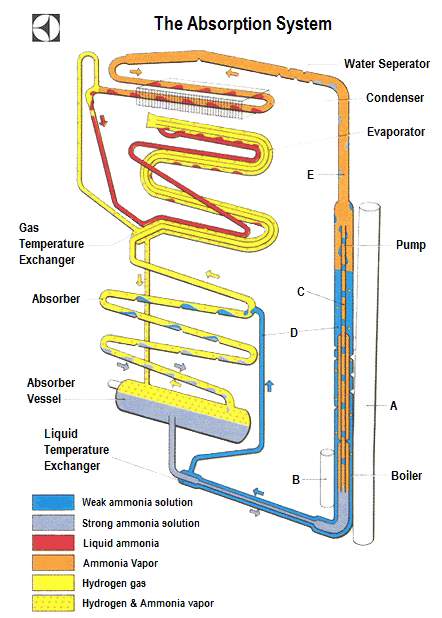 When heat is supplied to the boiler system, bubbles of ammonia gas are produced which rise and carry with them quantities of weak ammonia solution through the siphon pump (C). This weak solution passes into the tube (D), whilst the ammonia vapor passes into the vapor pipe (E) and on to the water separator. Here any water vapor is condensed and runs back into the boiler system leaving the dry ammonia vapor to pass to the condenser. The evaporator is supplied with hydrogen. The hydrogen passes across the surface of the ammonia and lowers the ammonia vapor pressure sufficiently to allow the liquid ammonia to evaporate. The evaporation of the ammonia extracts heat from the food storage space, as described above, thereby lowering the temperature inside the refrigerator. Entering the upper portion of the absorber is a continuous trickle of weak ammonia solution fed by gravity from the tube (D). This weak solution, flowing down through the absorber comes into contact with the mixed ammonia and hydrogen gases which readily absorbs the ammonia from the mixture, leaving the hydrogen free to rise through the absorber coil and to return to the evaporator. The hydrogen thus circulates continuously between the absorber and the evaporator. The strong ammonia solution produced in the absorber flows down to the absorber vessel and thence to the boiler system, thus completing the full cycle of operation.